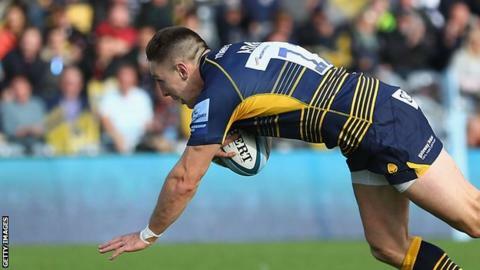 Worcester recorded their biggest Premiership win with an emphatic seven-try victory against Bristol. The Bears took an early lead with Yann Thomas's try but Warriors responded in style and had a try bonus point in the bag by half-time. GJ van Velze, Ryan Mills, Marco Mama and Francois Venter all crossed before the break in a dominant spell. Chris Pennell, Josh Adams and Bryce Heem scored further tries in the second half despite Ryan Bower's sending off. Victory for Worcester, under the watchful eyes of England head coach Eddie Jones, lifted them to seventh above Bristol, who drop a place to 10th. The margin of victory and the number of points scored were both Premiership club records for Worcester, as well as being their first home win of the season. But, it was the visitors who started the stronger when prop Thomas went under the posts for a try after Jack Lam's burst through the Worcester defence that gave little suggestion of what was to follow. Four tries in 26 minutes propelled Warriors into a 31-7 lead by half-time, including one for former Bristol player Mama and a breakaway from an interception inside his own half for centre Venter. There was little respite for Bristol after the break as centre Pennell and then Wales winger Adams added two more within seven minutes of the restart. Not even replacement prop Bower's red card for foul play could open up any more space for a Bristol consolation score. Heem's late try added gloss, moving him level with team-mate Adams and former Warriors winger Miles Benjamin on 20 Premiership tries for the club. "We managed to convert pressure into points, which is something we've struggled to do in this opening block of matches, so that made a huge difference. "Every chance we got, we pretty much took. We should've won the Wasps and Newcastle games here, so the key today was finishing every opportunity. "It was a real team performance. Even the lads who didn't get selected for the 23 played a major role in practice. "All the staff at the club also play a part in this, so they deserve credit too. The supporters certainly make a huge difference as well through thick and thin." "We're not happy with that performance, but you get them sometimes in rugby. I've had them many times before as a player and a coach. "As I've said to the players, it's what you do from these games that will be important. We need to be honest from the review and build and move on. "We've got five weeks to work on it and tidy up wasn't right and get the horse back on track. "It's a reinforcement that it's a team game from this result, one guy makes a mistake and it has a knock on effect." Worcester Warriors: Pennell; Heem, Venter, Mills, Adams; Weir, Hougaard; Black, Singleton, Schonert, Bresler, Barry, Mama, Lewis, Van Velze. Not used: Heaney, Lance, Humphreys. Bristol Bears: Kirchner; Morahan, Hurrell, Piutau, Leiua; Madigan, Uren; Thomas, Thacker, Afoa, Holmes, Joyce, Luatua, Smith, Lam.